LONDON - They were once two of the most powerful people in the British media, senior executives for media mogul Rupert Murdoch and associates of Prime Minister David Cameron. Former News of the World editors Rebekah Brooks and Andy Coulson are due to go on trial Monday, along with several others, on charges of hacking phones and bribing officials while at the now-shuttered Murdoch tabloid. The trial unfolding in a plain, starkly lit room at London's Central Criminal Court should provide high drama for media watchers — and an unwelcome reminder for Murdoch and Cameron of the two-year-old scandal that continues to tarnish Britain's media, politicians and police. Murdoch tweeted about the upcoming trial earlier this month: "Remember, everyone innocent until proven guilty, entitled to fair trial in most countries." The three highest-profile defendants are: Brooks, 45, ex-editor of the News of the World and former chief executive of Rupert Murdoch's British newspapers; Coulson, 45, another former News of the World editor who was Prime Minister David Cameron's communications chief until 2011; and Rebekah Brooks' 50-year-old husband Charles Brooks, a racehorse trainer. Coulson and Rebekah Brooks have become the faces of the scandal, though neither has been convicted of wrongdoing. He was the elusive figure — rarely photographed — behind Cameron's canny media strategy. She was the flame-haired high-flyer who exchanged text messages with her friend and neighbour Cameron while overseeing Murdoch's politically powerful British newspapers. They face trial alongside former News of the World managing editor Stuart Kuttner, ex-news editor Ian Edmondson and former royal editor Clive Goodman; Rebekah Brooks' former assistant Cheryl Carter; and Mark Hanna, former security chief at Murdoch's News International. Brooks and Coulson are charged with conspiracy to intercept communications — phone hacking — and with conspiracy to commit misconduct in a public office, which covers bribing officials such as police and prison guards. The other former News of the World journalists face related charges. Rebekah Brooks, Charles Brooks, Carter and Hanna are accused of conspiring to pervert the course of justice by removing material from the company archive and withholding computers and documents from police. The defendants deny all the charges. HOW DID THE ALLEGATIONS ARISE? The charges stem from the scandal that erupted in 2011, when it was revealed that journalists at the News of the World eavesdropped on the cellphone voicemail messages of celebrities, politicians, crime victims and others in the public eye. 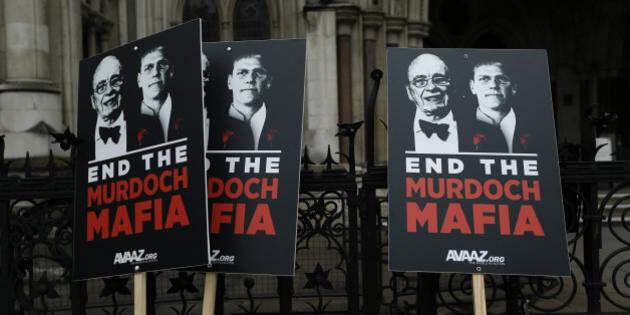 The furor led Murdoch to close the News of The World and triggered police investigations into phone hacking, computer hacking and the bribery of officials, which have expanded to take in other newspapers. More than 30 people have been charged, including senior journalists and editors from the News of the World and its sister paper, The Sun. WHAT ARE THE ISSUES IN THE TRIAL? This will be a long and complex trial, expected to last up to five months. The first step will be selecting a jury; the prosecution is expected to begin outlining its case later in the week. Judge John Saunders will ask jurors to ignore everything they may have heard about the defendants and focus on the evidence. The dozens of journalists on hand face restrictions including a ban on tweeting from court as the judge attempts to rein in speculation and comment. The central questions are: What did Brooks and Coulson know, and how widespread were illegal practices during the periods when they ran the newspaper? Brooks edited the paper between 2000 and 2003; in 2002, it hacked the mobile phone voicemails of a murdered 13-year-old, Milly Dowler, while police were searching for her. (Brooks denies knowing about any of the hacking). Coulson was in charge from 2003 to 2007. WHAT SENTENCES COULD THEY GET? The maximum sentence for phone hacking is two years in prison, while the other charges carry a maximum life sentence, although the average term imposed is much shorter. WILL THE TRIAL PUT AN END TO THE SAGA? Not likely. The hacking scandal convinced many politicians and members of the public that Britain's press was out of control. Cameron ordered a judge-led inquiry into media ethics, which recommended an independent press regulator be set up with state backing. Many editors and journalists fear that could lead to state regulation, but they may find it hard to resist amid a new blare of publicity about media misdeeds. Revelations at the trial also could heap new pressure on Murdoch, who remains atop his now-fractured media empire. The scandal led him to shut down his bestselling newspaper, pay millions to settle lawsuits from hacking victims and split his News Corp. into two businesses, a publishing company and a media and entertainment group. The former News International chief executive has pleaded not guilty to five criminal charges spanning a nine-year period, including conspiracy to hack phones and conspiracy to pay public officials for stories. Brooks, 45, also faces further charges connected to allegations that she conspired to pervert the course of justice after she was arrested in 2011. The former editor of the News of the World has pleaded not guilty to charges of conspiracy relating to phone hacking and alleged illegal payments to public officials. Coulson, 45, stepped down from his role of Director of Communications for David Cameron in 2011. The former assistant news editor of the News of the World faces charges of allegedly conspiring to intercept mobile phone voicemails. Edmondson, 44, denies the charges. The former managing editor at the News of the World faces charges of intercepting mobile phone voicemails. The 73-year-old denies the charges. The former News of the World royal editor is accused of two charges of conspiracy to commit misconduct in a public office by paying officials for information. Goodman, 55, has pleaded not guilty. The 50-year-old husband of former News International chief executive Rebekah Brooks is charged with conspiracy to pervert the course of justice by hiding documents and computer equipment relating to the phone hacking inquiry. He denies the charge. Similar to Charlie Brooks, Hanna, the former head of security at News International, faces a charge of allegedly hiding documents and computer equipment from police in 2011. The 50-year-old has pleaded not guilty. The former PA to Rebekah Brooks is accused of an alleged conspiracy to access private voicemails. The 49-year-old pleaded not guilty earlier this year.